Around the Table: Don't Show Up Without It! “It” refers to the best Mandelbrot in the whole world. Pure and simple. 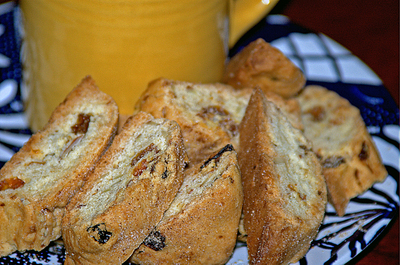 I know what you are thinking: your Grandma Rifka, your sister Sarah or your Aunt Leah makes some pretty darn good Mandelbrot- those crispy biscotti-like cookies filled with nuts, raisins, perhaps dried cranberries and maybe even some chocolate chips. But I am a purist and so I insist that my mother-in-law, Rhoda Weston’s Mandelbrod is better. Almonds, raisins, almond flavoring and a custom mixture of cinnamon and sugar are all she uses to achieve that perfect blend of crunchiness but not tooth-breaking consistency and sweet but not overly sugary flavor, ensuring a perfect compliment to a cup of tea or coffee. If you are one of Rhoda’s kids, grandkids, great grandchildren, nieces, nephews, friends, nurses in her doctors’ offices, household help, clergy or favorite retail vendors, you know exactly what I am talking about. And I know that even if you haven’t actually said the words to her, you never want her to show up without it! While there is no agreement as to its origin, the word Mandelbrot has German/Yiddish roots: mandel (nut) and brot (bread) and was a favorite of Eastern European Jews. The recipe below appeared in a newspaper some sixty years ago but has since become a Weston tradition and we now simply call it Rhoda’s Mandelbrot. We know that whenever we walk into Mom’s kitchen, a tall, clear glass jar with a stainless steel hinged top will be filled with these delectable cookies. The only thing we don’t know is how many “ends” we’ll find. After all, there are only two ends to every log. We keep hoping that one day she’ll present us with a jar full of those extra crispy ends. Recently, another beautiful grandson entered our world and we attended his naming. Of course great grandmother Rhoda sent an aluminum tin full of Mandelbrot in honor of the occasion. Or so we thought! Nino, the baby’s father refused to put the cookies out for the guests and hid them on top of the refrigerator. Apparently, like precious gold or coveted drugs, this batch was his private stash! I can’t think of a better way to spend a Sunday: baking Mandelbrot (only my second time! ); putting them in a tin to send to my boys in Chicago and St. Louis, and connecting with a time-honored and treasured family tradition. Excuse me while I go make myself a cup of tea and steal a couple of pieces. Beat the eggs, sugar and oil together in a large mixing bowl. Add almonds, raisins and extract and mix well. Add flour; mix well and form into a glossy ball. Divide the ball into four quarters. Form each quarter into an 8-inch length bar. Place two bars on a cookie sheet lined with parchment. Sprinkle with the cinnamon and sugar mixture. Repeat procedure with other two bars. Bake for 45 minutes. Remove from oven and cool slightly. While still warm, slice each bar on the diagonal. Turn slices on their side and sprinkle with the cinnamon and sugar mixture. Return to oven for 5 minutes or until lightly browned. You hit the jackpot with this one Darling. I have spent 62 years stealing the ends every chance I get. Mom is the maven on this subject and so many more and I love your tribute to her. Well timed by the way: she will be with us in two weeks and she better not show up without it! Other than the fact that your Mom called it Mandelbrot and my Mom called it mandelbread, it looks and sounds like the same recipe. Maybe their parents came from the same shtetl! In any event, the mere mention of mandelbread evokes strong, positive emotions for me tied to flashbacks to lots of happy family events where my Mom's mandelbread was on the table. Thanks. Thanks Ronnie. I certainly appreciate your kind words. ...and now Rhoda's Mundelbrot will be showing-up ateven more gatherings. Thanks for sharing the recipe and the history. OK. Now that I am over the flu and have taste buds again, I think it is time my new neighbor came over with some of these delectable things called Mandelbrot.I am still healing from a back incident that was caused by ,you guessed it, picking up a pair of sox!Thanks to my new friends for playing ambulance driver. Oh yeah whats a shtet??? Thank you for this recipe. I love Mandelbrot, but never knew how to make it. My Publix always carries it around Passover time and I grab it when I see it. I am certain that yours is waaay better! Susan, thanks for visiting. Make a batch and let me know how it turns out. Tracy, the word shtetl: Many of our family members came from Eastern Europe and lived in Jewish neighborhoods called shtetls. I will bring you some mandelbrot on our next visit. Joel, I am so glad that you can connect with your mother through food. In my mind, there is no better way! Deb, your grandmother loves making these for you; now, you must continue the tradition. I am sitting here having a coffee and licking the expanded picture of the Mandelbrot on my monitor! Looks tasty! I think I also grew up hearing it called "mandelbread." You realize, of course, you are now completely "on the hook" to provide these marvels upon next visit. You have no choice!!! This goes for what's-his-name, too. Good stuff. Zio, thanks for your support. Come on over for the real deal. Mike, thanks for stopping by. Hope you had good luck finding the blood oranges. Saw some yesterday at Fresh Market in Clearwater. Paul, let us know when you are coming to visit. I will be sure to have a fresh batch waiting. The mandelbrot was as good as advertised. While their appearance is like biscotti, the consistency is different. The cinnamon is a nice accent, while not overpowering the flavor. Big thumbs up from the big man & his family. Thanks so much. I am not a baker. But after reading your story about the mondelbrot I had to try. They are in the oven now. Thanks for sharing. I really enjoy your blog. Gonna use this recipe for Thanksgiving! Thank you!